The development of digital technology as if it never stopped. New technology is always present and replace old technology. The photographer was able to get a wide range of products and options that they can use to support a hobby or a job. There are many types of cameras that can be used to capture important moments such as digital cameras, DSLR, mirror, or mirrorless. 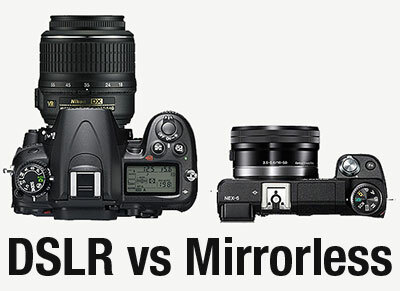 The main focus of this article is the comparison between mirrorless cameras and mirrors. Is the main perbedan between mirrorless cameras and mirrors? The main difference of course lies in the mirror (mirror) itself. Perhaps the term mirrorless cameras are familiar to photographers. Mirrorless camera is a camera without a mirror or pentarisma, but this camera uses a lens that can diganti.Fungsi of itself is a mirror to reflect the light coming from the camera's viewfinder. This technology has been marketed since 2008. At first glance, this camera is not much different from DSLR cameras. If you compare it with a DSLR camera, the difference lies in how to display an image or images in the viewfinder. To display an image, the camera is still using mirrors require particular room. As a result, the size of the camera becomes larger. Despite having the same function, the concept of mirrorless cameras and camera mirrors remain distinct. This camera does not need a mirror and a camera the size of a slimmer and lighter weight too. Mirrorless camera does not work like a DSLR camera or other mirror-based cameras. To display an image, the camera is implementing an electronic viewfinder or hybrid viewfinder. This feature allows users to switch to the electronic viewfinder optics. At first glance, mirrorless cameras have a more attractive appearance because of its size slimmer, lighter, and the lens can be adjusted. The camera has a mirror and mirroless sifinikan appreciable difference in performance. However, the difference is not too far away. Mirrorless camera is able to focus quickly when you want to capture a particular object. Although the mirror like a DSLR camera is able to do it better, a lot of photographers who had had enough with the mereka.Selain mirrorless cameras, mirrorless cameras can take pictures faster. This camera does not need a mirror to reflect light. The light reflected directly to the image sensor and shorten the time course of picture takers. Mirrorless cameras are also more 'quieter' than the camera mirror. When you use a DSLR camera, the camera will beep when taking pictures. The sound is the hallmark of the photographer. Mirrorless cameras is becoming a more attractive option, especially when viewed from the aspect of design and price. However, the mirror like a DSLR camera is certainly far superior in performance. In other words, this camera is more suited for professionals who really want to wrestle the world of photography. DSLR camera prices of course much more expensive than a normal camera with very limited features. There are some considerations that you need to know to choose either a mirror or a camera mirrorless. Goal of becoming an important factor for choosing a particular camera. If you want to further pursue the world of photography, DSLR cameras such as the mirror can be a very appropriate choice. Features and operation of these cameras is far more complex than a regular camera and of course directed by people who want to be serious in the world of photography. Price is also an important consideration. To get the best price, you can buy a camera during an exhibition or through online stores usually offer cheaper prices.